iBreviary, one of the world’s leading apps providing the texts for the Liturgy of the Hours (or Divine Office), added a new language to its offerings this week: Arabic. That may seem to be a benign gesture. It isn’t. Consider that parts of the Islamic world have banned the printed versions of this form of prayer. The developer of iBreviary, Father Paolo Padrini, says he is meeting the challenge of this censorship by offering a means for Arab-speaking Christians in those regions to read the texts on an iPhone. This is a significant and bold move in the Catholic app world as a gesture of love. 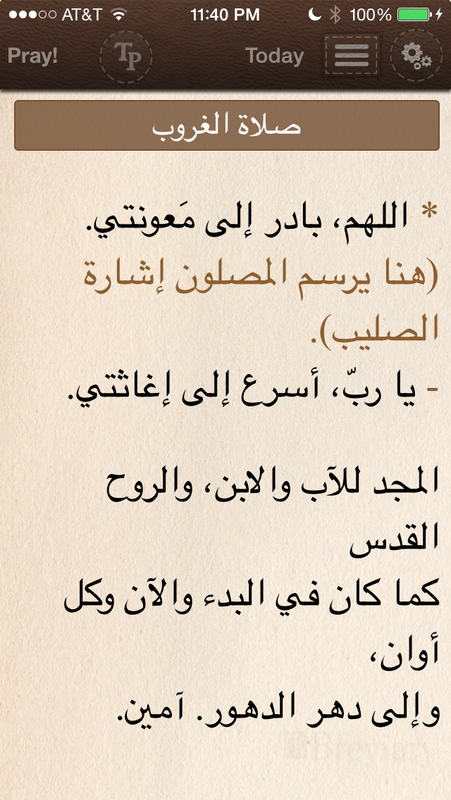 Screen shot of Arabic version of Vespers prayer in iBreviary app. Initial launch of this version is only on iPhone platform. iPad and Android versions forthcoming, according to the app’s developer. “Now, with the launch of the Arabic version, the app can be used in those Muslim countries where the breviary [Liturgy of the Hours] is banned from sale and where, in some countries, you cannot legally even possess one,” said Father Padrini. The app for iPhones is free and the Arabic is produced by volunteer translators, he said. The iPad version will be available in three weeks and the Android version by the summer. Father Padrini said assisting Christian congregations in Muslim countries was increasingly important as priests suffer persecution and violent attacks. Keep in mind, iBreviary offers more than just the Liturgy of the Hours. This powerful app also contains the complete text of the Roman Missal, now in Arabic–a bit of an anomaly as the language is typically used in other Rites, is it not? We pray for Father Padrini’s ministry and those in regions of the world who pray using these texts under threatening circumstances. ← Pope encourages reading Bible ‘by any means’ including mobile phones and tablets! Thank you for your question. Once you download iBreviary, it is very simple to change the language settings. On your device, go to the home screen and touch the colored language circle. That opens the language menu. Select a language to download. Hope that helps. Let us know if you have any other questions. God bless you in your mission work! You have a beautiful blog.